My gourd luminarias are among my favorite things. They punch patterns in darkness. 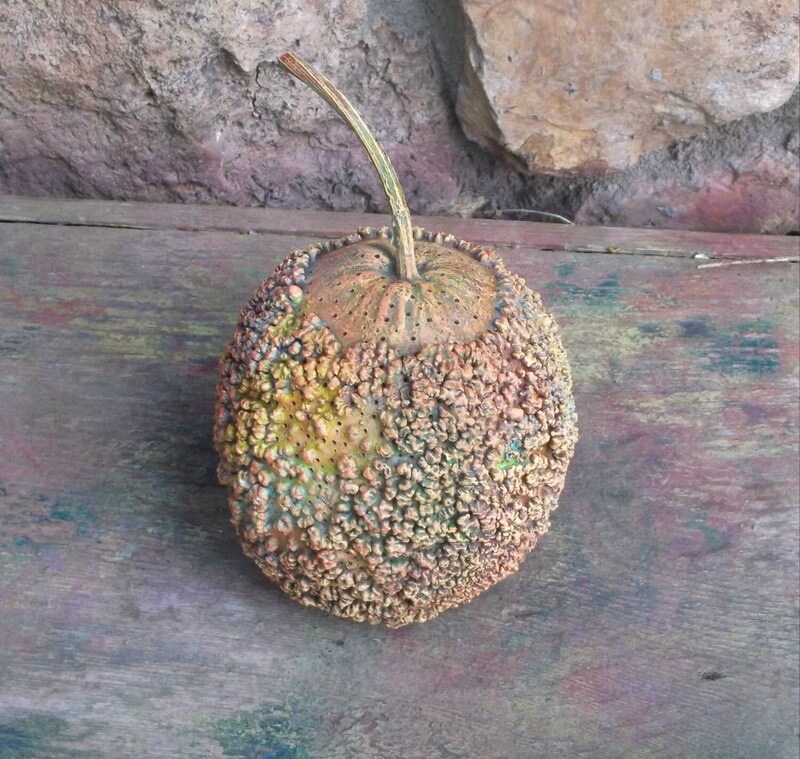 The holes in the gourd are round, and surprisingly throw Z,N,M-looking patterns on ceilings and walls. The photograph gives you an idea, but the reality is gently spectacular. 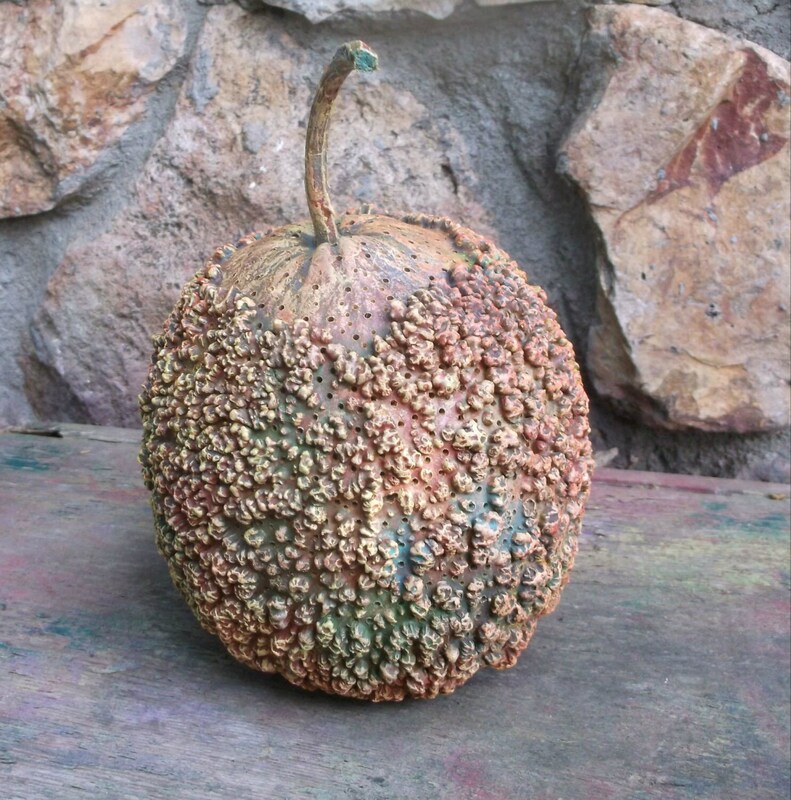 This luminaria is an African wartie gourd, not seen real often in this (USA) part of the world. 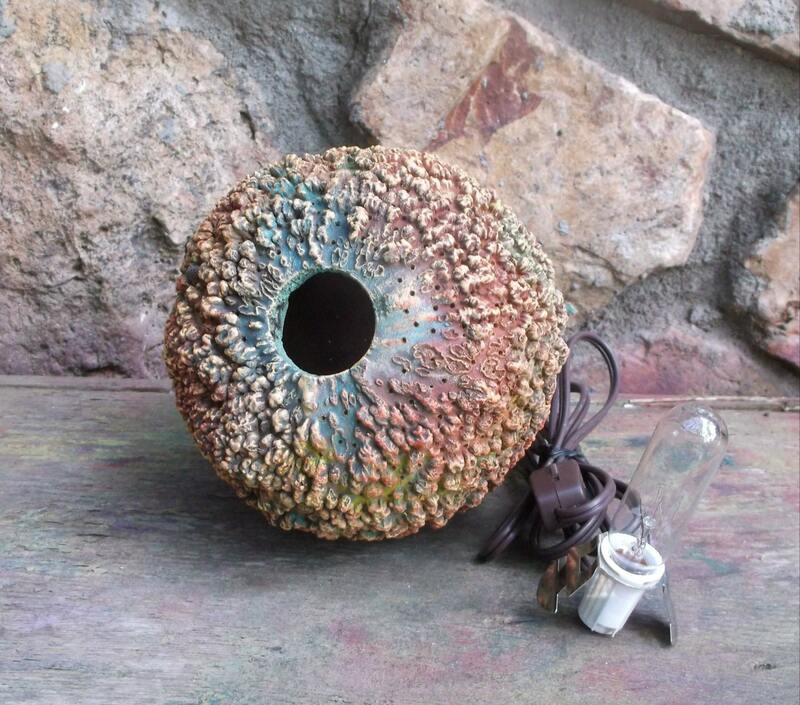 I've painted it enough to give it a patina, but not so much you can't see the beautiful natural texture of the gourd. Warties are tough as rocks. Stout. Bossy. They tell me where to drill the holes. There's nothing contrived about hole placement. Each gourd will produce its own pattern. The gourd is about the size of a large grapefruit, 16" around. The luminaria has a 6-foot electric cord, with an on/off wheel switch; 15-watt bulb. Replacement bulbs can be purchased at Wal-Mart, Lowe's etc.Colored bulbs add dimension to the light show. 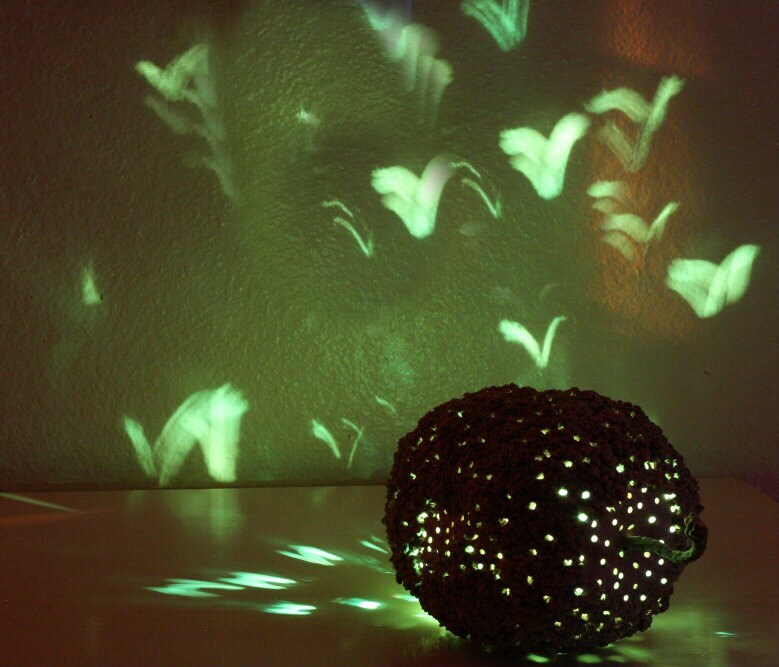 The photos in the dark show how a green or red bulb change the look of the light show. The luminaria comes with a clear bulb. I have a few white cords should you prefer. Just convo and let me know. 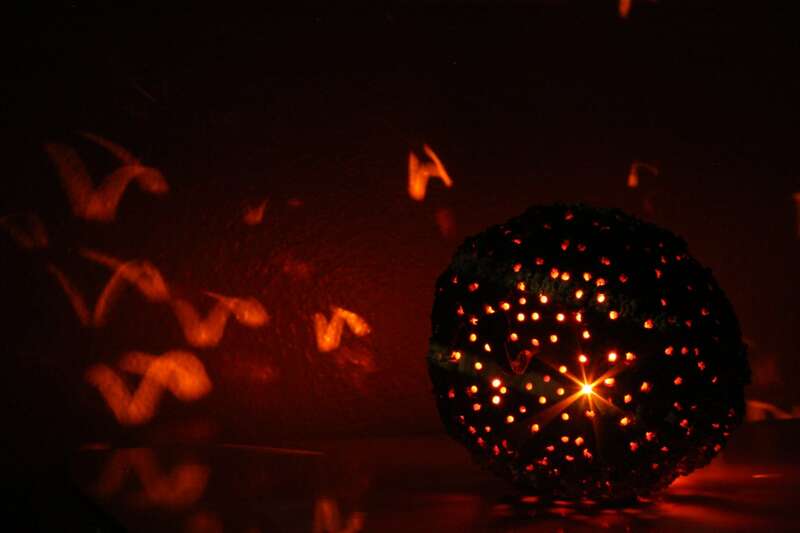 These are great in nurseries and children's bedrooms as night lights. Something interesting to see and talk about and think about as sleep beckons. The darker the space, the better the show. INCLUDED: Priority domestic mailing. If your purchase is a gift, let me know at checkout and I'll include at no extra charge, a hand-painted post consumer gift bag with sturdy handles, post consumer tissue and a gourd sheet chockful of gourd lore and trivia.